There is a lot of stuff about the cold weather that I really don’t like – blizzards, frost bite and having to change my wardrobe to pants instead of cargo shorts. One thing I do like about cold weather is comfort food. To me, slow cooked cuts of meat are as delicious as a tender ribeye off the grill in the summer. 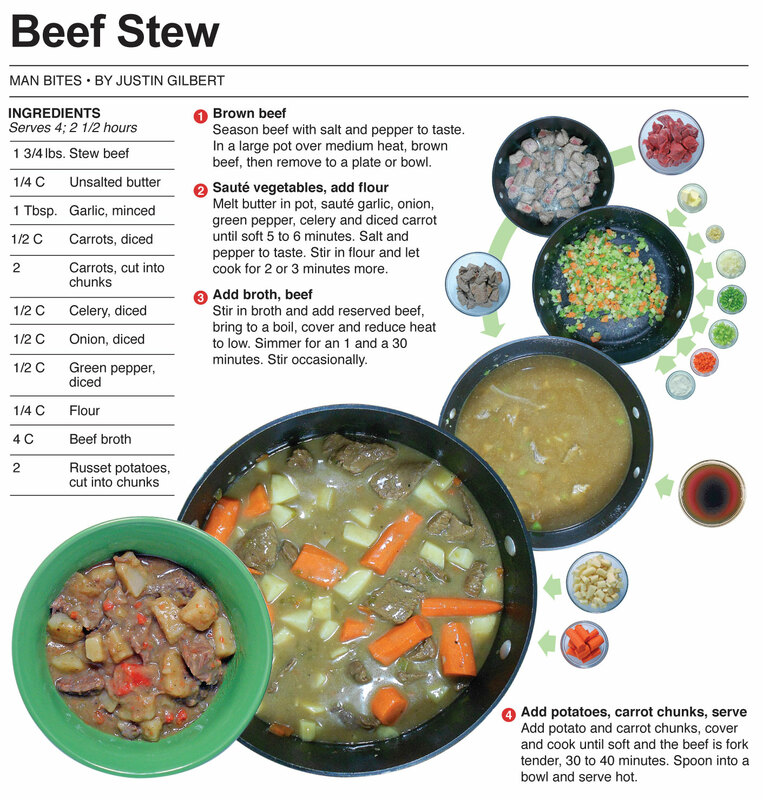 One of my all-time favorite comfort dishes is beef stew. I consider the potatoes and fork tender beef as just the icing on the cake in this dish. Like a great drummer in a rock band, the real star of a good beef stew is the gravy like liquid that brings everything together. 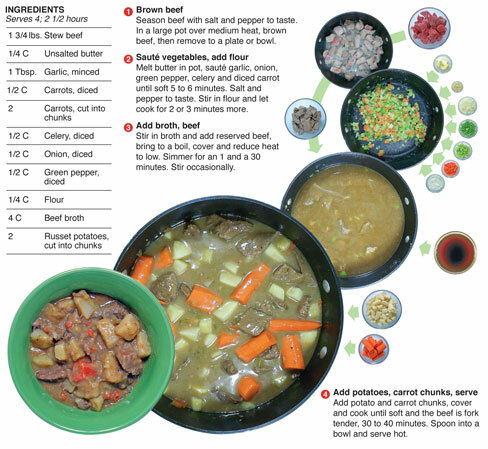 Some stew recipes call for the liquid to be thickened at the end of cooking. 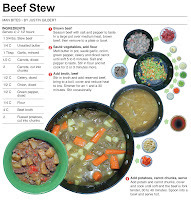 I like to thicken it near the beginning - with root vegetables mixed in to imparted their flavors into the beef as it is cooked tender. Also, I add carrot and potato chunks near the end of the process so they aren’t over cooked. For this recipe, I broke out the cargo shorts and spent a couple hours in my cozy kitchen creating a dish that will warm the soul. I documented this dish the day before Thanksgiving – six days before it would go to press – and the weather in Fort Wayne was unseasonal to say the least. We have been enjoying a rather warm fall so far. I worried that this recipe would run in the paper and it would still be warm out. The forcast called for a cool down - But you never can tell with the weather. I grilled a Turkey breast on charcoal for Thanksgiving thanks to the warm weather. The day after, the high temperature was in the lower 60s and I was wearing my cargo shorts while raking leaves and covering stuff up outside – basically using the warm weather to get things ready for winter. Our mild fall allowed this work to occur after Thanksgiving this year rather than after Halloween. As if on cue though, old-man winter swept through and dumped four inches of snow on us the day before this recipe went to press. Sometimes the stars aline just right and a project comes together. 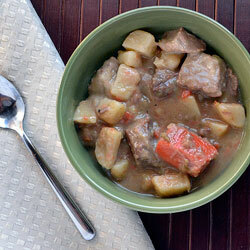 I knew the cold was coming and really wanted to share a favorite comfort dish which is why I chose stew. It would have been odd to publish this recipe when the weather man was calling for highs in the 60s. Instead, when readers got this, the ground was covered with snow here in northern Indiana. Which I hope made it seem even more appetizing. I really hate to pack away my shorts in the winter, I usually keep a pair out for lounging around the house. In the summer, I will go months wearing shorts – it takes a wedding or a funeral to get me to do otherwise. Well, it's cold and wintery here now, and it will be that way for the next several months – I need a winter home in Florida! Yours are definitely the most striking recipe designs I've seen on any food blog. They look great!